Lean IT Leadership is a principle-based approach to ensure that IT people, IT processes and information technology work in harmony to create long-term value for the users of IT services. 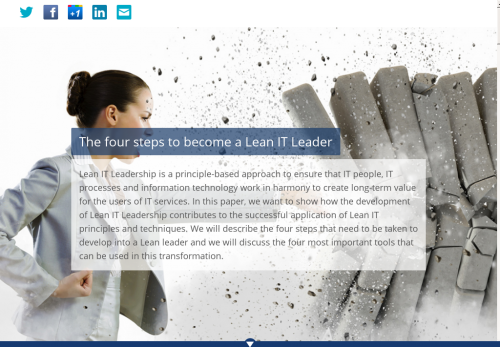 In this paper, we want to show how the development of Lean IT Leadership contributes to the successful application of Lean IT principles and techniques. We will describe the four steps that need to be taken to develop into a Lean leader and we will discuss the four most important tools that can be used in this transformation. Leadership plays a critical role in the successful application of Lean principles within any organization and in any industry in order to focus effectively on customer value and achieve both strategic and financial advantages. A lack of leadership is directly related to a lack of success when implementing Lean. In a world where new businesses and potential competitors arise on a daily basis it is becoming more and more important to be Lean. Continuous improvement is necessary to keep one step ahead of the competition and waste needs to be removed in order to work in an efficient way. Over the past years, we have helped various organizations to transform into a Lean organization while eliminating waste and creating value for their customers. Our experience is that the leader plays a crucial role in these transformations. This leader sets the example by fostering an environment in which continuous improvement is not only something that is talked about during the week start but also becomes a way of thinking and acting that forms part of the organizational culture. The development of Lean IT leaders is based on the Lean Leadership Development Model as described by Jeffrey Liker in his book Developing Lean Leaders at all Levels, Jeffrey Liker, 2014. The model contains four steps for developing Lean leaders and a set of ‘True North’ values. The most important step for a Lean leader is to make the explicit commitment to develop. This means making a concerted effort to go through individual learning cycles focused on improving the ability of the leader to adhere to the True North values and improve the ability to execute the other steps. These True North values are a starting point for an IT organization when setting out on its Lean IT journey. Committing to self-development is the prerequisite for the success of Lean within any organization, and it is no different for IT organizations. By self-development, we mean the act of reflecting honestly on one’s own actions, thoughts, behavior and attitude with the aim of making these more effective. Potential leaders need to be given the opportunity to self-develop and they need to be supported through the course of their development. Leaders do not self-develop on their own. Supporting self-development means finding the right self-development challenges, allowing space for self-development, and providing coaching at the right times during the process. Self-development is an activity that requires both individual reflection and feedback from outside. Committing to self-development does not mean, for example, that you commit to reading a book about how to be a better leader and then doing your best to implement some of the ideas or suggestions; it means taking steps in changing behavior. It is an activity that needs to be planned and carried out on a regular basis. The challenge of self-development is therefore threefold: self-development requires deep commitment, you need a coach and you need to practice. Shu (obey): learning how to do something Within IT, new engineers become familiar with the IT environment by starting with operational activities; simply ensuring that the systems are ‘cleaned up’ on a daily basis so that they continue to function correctly. A next step would be to carry out standard changes such as getting a new laptop ready for use. In both cases, the work will be accompanied by either a checklist or a set of steps to be followed in a specific sequence. Ha (detach): then varying the way you do it Within IT, an engineer will have moved on from carrying out standard changes to executing a non-standard change. This will need to be carried out according to the agreed change process, whereby small variations will be acceptable between the key decision moments. The engineer will be able to identify small improvements, for example in the checklists for operational activities. Ri (separate): developing a new way of doing it Executing a project is an IT form of Ri. The engineer is so well-versed with the execution of both standard and non-standard changes (which together make up the project) that he/she can improvise with both forms of change with the aim of achieving the project results. At the same time, the kata of executing a project must be respected. Depending on how experienced the project manager is, he/she may even be at the Ri level in managing the project. The first step in the Shu-Ha-Ri of Lean IT leadership is to define the kata of your own leadership as a Lean IT leader. This means building your Leader Standard Work. What leaders do for their own development, they must also do for the development of others. This means identifying, mentoring and nurturing the potential in others, and ensuring that this is developed and used to the best effect within the organization. This is done by giving autonomy to individuals and teams, providing appropriate challenges, and improving capabilities through training and coaching. Each potential leader must follow the development path, starting with a commitment to self-development. The established Lean IT leader is both a role model and a teacher, in short: a sensei. In this capacity, the Lean IT leader must seek out the people who need to be helped with their development. These people can be found in a particular place: the Gemba (click for more information), the place where the work is done. Examples of the gemba in IT organizations are a software development team where work is often project-based with a focus on the quality of deliverables. Or, a service desk where work is often client-based and production-oriented with the goal of meeting the expectations of the client. A service delivery team, on the other hand, is more process-oriented and focuses on complying with process standards. Due to the different work environments in which IT teams operate, it is crucial for Lean IT leaders to understand the different goals and the work of each type of team so as to be able to provide support, teach and motivate the team members in order to increase customer value. Seeing and prioritizing problems: are both managers and employees truly prepared to uncover problems, accept them as a part of daily life and initiate actions to identify the problems that most need solving? Solving problems (click for more information): are both managers and employees prepared to invest time and other resources to understand the root causes of problems and resolve problems completely? Sharing lessons learned: are both managers and employees driven to share lessons learned as a result of solving problems with others in the IT organization, so that they can also benefit? The concept of continuous improvement is embraced widely by organizations working with Lean. However, we have learned that aiming for improving on a frequent basis is something different to actually embedding daily kaizen within your team. We basically see two things in our daily experience: first, organizations in which a Visual Improvement Board is placed on the wall on which improvements are gathered but there is little or no progress made on the identified improvements. The Lean IT leader plays a crucial role in helping and facilitating the team to actually achieve the identified improvements. This might mean coaching team members to help them to execute an improvement or remove impediments, or ensuring that decisions are taken at a higher management level. Second, organizations in which the Visual Improvement Board remains scrupulously empty. Team members claim there are no improvements to be made. In these situations, the Lean IT leader supports the team by challenging team members to convert frustrations into improvements or, for example, by organizing a collective brainstorming session during which improvement possibilities are sought. In both cases it is the Lean IT Leader who injects new energy in supporting daily Kaizen. The leader must ensure that everyone in the organization knows what the organization stands for and what it is trying to achieve. Leaders establish structures and processes to cascade True North values throughout the organization and they nurture a culture of personal accountability to ensure that supporting goals are defined and realized. They ensure that the goals are shared and are consistent across the individual teams within the organization. Lean IT leaders must create a vision and align the goals within the IT organization. In doing so, a Lean IT leader is responsible for communicating the vision and goals. Where the required communication regarding other aspects largely consists of motivating, teaching and supporting, the communication in this area involves creating a consistent story. The mechanism used within Lean to translate longer term goals into more mediate goals is called Hoshin Kanri. Literally, Hoshin means ‘pointing device’ or ‘direction’ and Kanri means ‘management’. Hoshin Kanri is usually translated as policy deployment. Hoshin Kanri is a cyclic planning and management concept applied at the strategic level to achieve breakthrough objectives, and at the day-to-day level to manage the operations needed to keep the business running. Hoshin Kanri sets big-picture objectives which are translated into specific actions through daily management. In organizations with different management levels, catch-ball communication techniques are used to translate organizational goals into team goals. Top management sets the overall vision for the IT organization. At each level throughout the hierarchy, managers and employees participate in defining the strategy and drawing up a detailed action plan, which they will use to attain their targets. They also define the measures that will be used to demonstrate that they have successfully achieved their targets. The catch-ball process works like this: the ‘need’ (a proposed vision or direction) is expressed by the leader, and the subordinate responds with an interpretation of what that direction will mean within the subordinate’s realm of responsibility. The leader then reviews the response with humility, and remains open to proposals or ideas he/she had not considered previously. As the ball (idea) is passed back and forth, new ideas emerge, as does a consensus on the right course of action. First, committing to self-development by setting personal goals on a daily basis to improve your personal way of working. Second, creating opportunities to coach and develop the people you work with to help them develop themselves. Third, continuous improvement by stimulating the daily kaizen mindset is achieved by challenging the status quo and by encouraging team members to take (small) actions to improve any obstacles they encounter in their work. Improvements that require more profound investigation to determine the root cause, or issues that demand the involvement of other stakeholders can be a topic for a kaizen event. Finally, the Lean IT leader plays an essential role in creating a vision and aligning goals to make sure team members know what the organization stands for and how they can contribute at a personal level to these organizational goals. The Lean IT Leadership Development Model is not a static model in which the ‘end state’ will be achieved by going through these four steps. The idea of continuous improvement in small steps is also applicable to the Lean IT Leadership Development Model itself. Your personal journey to become a Lean IT leader starts by committing yourself to the challenges of self-development. Start with spending time on the Gemba, set yourself a daily personal improvement goal, spot talent in the teams you work with and find a coach to help you in developing yourself. Niels Loader is a Principal Consultant with Quint, and one of the leading experts on Lean IT & DevOps. He is the Content Board Lead with the Lean IT Association (LITA), and is Chief Examiner of Lean IT with APMG. Niels brings extensive experience in the areas of IT Service Management, IT Performance Improvement, Lean IT and DevOps.